Posted on Thu, Aug 26, 2010 : 7:10 a.m.
Barry Pierson has a secret. 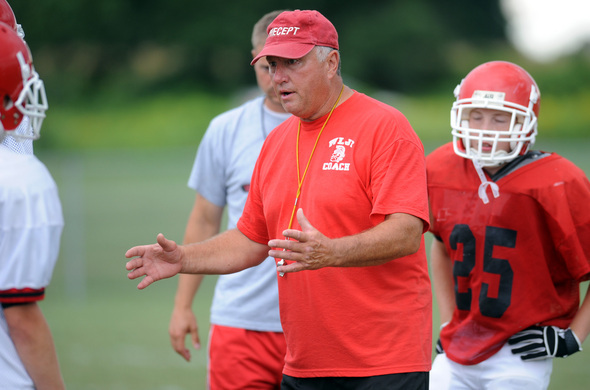 The 62-year-old first-year football coach at Whitmore Lake High School knows some of his players have probably been nosing around the Internet, looking for some information on him. But he hasn’t been forthcoming with details. What Trojan players had to find out on their own is that Pierson was a star player in what was undoubtedly the most famous football game ever played in Washtenaw County. On Nov. 22, 1969, first-year University of Michigan football coach Bo Schembechler and his upstart Wolverines upset No. 1-ranked and defending national champion Ohio State 24-12 at Michigan Stadium. It’s the most famous game (from a Michigan perspective) in one of college football’s greatest rivalries. 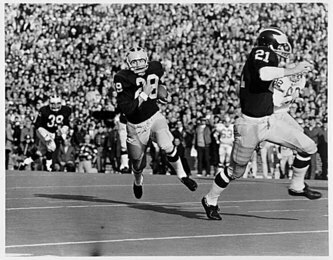 And on that cold Saturday afternoon in Ann Arbor, against what was considered the greatest football team of all time, Barry Pierson played the best game of his career. The 6-foot, 175-pound defensive back from the Upper Peninsula intercepted three passes and returned a punt 61 yards to set up a Michigan touchdown. Tell us about that game, Barry. After his playing days and four years on Schembechler’s staff as a graduate assistant, Pierson still has many close ties to former members of the Michigan program, which was one of the selling points when the Whitmore Lake position became available when John Preistap resigned. He knows Lloyd Carr will be at a Whitmore Lake game, saying with a laugh that the former Wolverine head coach will be “critiquing me after I critiqued him for so many years.” He jokes about asking former Michigan head coach Gary Moeller and assistant coach Jerry Hanlon to join his Whitmore Lake staff. Pierson’s on-again, off-again coaching career - which includes a Class D state championship at St. Ignace in 1983 - now spans five decades. He took time off to watch his own three boys play college football and also owned Mackinac Fish Company, a fish wholesale and retail business in St. Ignace, for 21 years until selling it recently. His wife, Cindy, operates several stores on Mackinac Island that have been in her family for nearly 60 years. She’ll remain on the island until the tourist season ends in early November while Pierson has rented his own apartment to stay in while he coaches the Trojans. Pierson may need an ear this season. The Trojans are young and inexperienced, with nearly half of its small varsity roster made up of sophomores. But their new coach is certainly putting in the effort. Pierson, who was a teacher for six years before opening his fish company, is not a member of the Whitmore Lake staff. But this winter he scoured the school for an open space to call his office. Part of “this and that” included hopping on a mower and carving out his own practice field, so that players didn’t need to commute across US-23 to the school’s old football field. One thing Whitmore Lake football players didn’t need to scour the Internet to find out was what type of sideline demeanor their new coach has. Wed, Dec 29, 2010 : 3:22 a.m.
Coach Pierson is tough but after the season we had he has to be what we did this year was absolutely terrible but with him bringing in a new offense then the one we had before it wasnt going to go smoothly this year we will be better more disciplined and more in shape. Fri, Aug 27, 2010 : 6:45 a.m. I was in Chicago when that game was played my sister was dating an ex Illinois football player and he carried on about how ohio state was going to destroy Mich. Ya, that was a great game for me not only cause Mich. won but I didn't like that guy my sister was dating. Thu, Aug 26, 2010 : 2:20 p.m. It's nice to see Barry Pierson back in the area coaching. He had probably one of the best defensive games in Michigan football history in that OSU game in 1969. 3 interceptions PLUS a long punt return that set up a TD. Amazing.